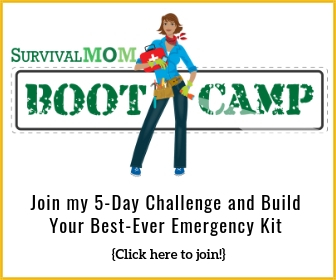 Dear Survival Moms: Can you help Shelly? It’s not unusual that I get panicked emails from other moms, and sometimes dads. They feel as though time is running out to be prepared for an uncertain future that might include food shortages, increased natural disasters, societal chaos, and just about every other trouble imaginable. Last week I heard from a reader I’ll call Shelly, and since I believe that all of us together are stronger than just one of us, I wanted to pass along her email and call for help. Can you provide Shelly with tips and encouragement? I am mostly concerned because I am a disabled mom of 5 ages 9 to 23- one of which is also challenged with aspergers syndrome. I am truly feeling panic because my financial situation is pretty dire. I do not have very much at the end of each month to put into storage and preparedness even though I feel significant pressure to get it together not today but yesterday! Any ideas or suggestions for me as a newbie? I need to get caught up ASAP! I’ll be posting my own thoughts and suggestions, but I know that together we can help Shelly and other moms in a similar situation. I'd tell Shelly that since she is already struggling financially to keep her everyday pantry filled, she needs to first stabilize her current food needs by accessing local food banks for help. Once her day to day food needs are more stocked she can use a small amount of her grocery money to begin with water storage first and foremost and then some inexpensive food stores of rice, flour and special foods her children may need due to their age or health conditions. The very first thing that comes to mind is that there is a LOT of food out there to be had for free…especially now as the harvest is ending in many areas of the country. Watch your local farms, farmer's markets, roadside stands and orchards for seconds/freebies. Watch for fields that can be gleaned…I normally hit a pumpkin/squash patch and an apple orchard (with permission) at the end of the year for stuff no one wants. Watch freecycle and Craigslist, especially the week after Halloween for all the free pumpkins, squash, etc that you could ever want. I know apples, pumpkins, squash, etc does not a food storage plan make, but anything that you can get for free and then preserve at home can go a long way towards bulking up your pantry. And you don't have to have special equipment for preserving those items. Apples can be sliced, dipped in lemon juice and sun-dried. Pumpkins and squash can last for 6-8 months or longer in the basement. Of course, if you're able to can or freeze…by all means do it!!! Shelly! Congratulations on your motivation ! Now, take a deep breath and relax. You can do this. I can say that, because I did it. Once on less than 84 cents a month! The key is to make food storage and other areas of prepping a serious priority in your life. And get the kids on board. Start with basices that will last for decades: Rice, beans and pasta. Powdered milk, although it can be pricey. My experience taught me a couple of things. First, find out what your free resources are. In my area, which is heavily agricultural, it was not difficult to get fruits and vegetables from home gardeners and large farms alike. You have to look at produce less as art and more as sustinence. In other words, if half an apple is good and half isn't , you have half an apple more than you had yesterday! Learn to can, if you don't know how already. I learned by watching videos on canningusa.com. I started just a bit under three years ago, and I have canned about 2000 jars. If you want to can more than jellies, fruits and pickles, ask for a pressure canner for Christmas! Where to get the food? I utilized FreeCycle.org extensively. Check their web site and see if you have a group in your area. I got a big pot for water bath canning from Freecycle, water storage barrels, hundreds of pounds of fruit, and so much more that sometimes I can't remember what I DIDN'T get from freecycle. Are there farms in your area which might let you and the kids come and pick the fruit that was missed when the pickers came through? Most of the time you can get it free. Do you have room for a garden? Use every square inch available to plant SOMETHING! Get the kids involved, give them a pot and some dirt and see what happens. My nephew has Asbergers, and he is one of the most involved kids I know when it comes to projects such as those we find in prepping. I showed him how to build a rocket stove from bricks (you can find it on You Tube) and he ended up teaching his Cub Scout troop ! Learn about expiration dates. Once you do, you will feel very comfortable buying deeply discounted goods that are set to expire soon. Most of all, be patient. It will heppen. Winter is coming, and that's a great time to start stocking up on non-food items. Don't get fooled by the dollar store trap when you buy things…a bit of research shows that the per-unit price is higher. Okay, I am just rambling now. Sorry! I just wante to encorage you to think outside the box, and get creative. After a very short while, it will be second nature. 1. Cook with fewer processed foods and use the money you save by cooking with whole foods to buy foods suitable for storage. 2. Barter your skills or products you produce for fruits, veggies, and meats from other growers/farmers. 3. Dehydrate or can up foods for food storage. 4. Cut money from your budget by getting ride of a landline phone (assuming you have cell phone service), cable or satellite tv, or eliminating junk food from your grocery budget. Use the savings to fund your food storage purchases. 5. Reduce your purchases of costly cleaning supplies by making your own using baking soda, vinegar, and liquid castile soap. Use the savings to buy food storage foods and learn a new preparedness skill in the process! 6. Consider buying groceries in bulk with friends or families and split the order. Foods are usually less expensive when purchased in larger quantities. Use the savings to purchase shelf-stable foods for food storage. 7. Have a meatless meal once or twice a week and use the savings to purchase foods for food storage. 8. Let friends and family members know that you'd welcome their excess fruits or veggies from their orchards and gardens. Then dehydrate or can the foods for food storage. 9. Lower utility bills by turning down the thermostat, hanging laundry out instead of using the dryer, etc. Then take the savings and use it toward food storage. 10. Switch to using cloth napkins and use rags for cleaning rather than paper towels. Use the savings to purchase food for food storage. I would suggest that she first pray for wisdom about how to use her current food stores and the money available to purchase more. I would suggest she cut her new spending to the bone by buying only whole food items (no rice a roni, etc) as they are cheaper, healthier and more filling. If she watches the ads, she can buy those items at a better price and get more for her money. I would also suggest she ask friends who drink soda to save their large soda bottles as she can clean them and fill them with water and grains for storage. Her goals should start small, so as she quickly meets them she will become more motivated to work harder at cutting costs and storing food. My church serves dinner every wednesday night and goes through a LOT of 2 liter soda bottles. And so does our youth group for events. I stopped buying can sodas so that we would have 2 liter bottles, but have thought of also getting them from our church. I am sure that your church (or another church) would be happy to let you pick their 'empties' up each week to use for storage containers. I am a single dad and some times only have 20-30$ left at the end of the month. I looked and looked and found a local resturant supply place that is open to the public in my area. I started watching their deals, I got a 50 LB bag of long grain white rice for 17.95$ one month. The next I got a 25lb bag of red beans for 10.55$. Just getting those 2 items I started to feel more secure, it was a start and now I have more stocks, canned good, etc. I just keep pluggin away 20-30$ at a time, in a short time you will have much more than you thought you could have put together. My biggest piece of advice is to make a plan do what you can, and once you have done all you can try and relax a bit, ask the Lord to put your mind at ease, don't create more of an issue by creating more stress than you need. Shelly—You can do it. Everyone had to start somewhere. Start with some easily achievable goals like getting your 3 day water supply, gathering items for a 72 hour kit, creating a food storage plan. You don’t have to do everything today. I personally found that once I was committed to food storage and emergency preparedness things fell into place and doors were opened to me. Do as much as you can and things will work out. You can save money by not using store bought toilet paper a pads.Old tshirts and flannel shirts can be cut up into squares to be used instead of tiolet paper.Set up a bucket with water and laundry soap in the bathroom and take care of the same way as clothe diapers.Quit buying laundry detergent.You can make 3 gallons of laundry detergent with bath soap,washing soda and borax.The recipe can be found at the simpledollar.com.This can also be used to wash dishes,just don't expect it to suds up like commercial detergent.Reusable sanitary pads can be made with old flannel shirts and towels and the patterns can be found online for free.Or just trace your normal pads for a pattern.You will need a water proof material for this,perhaps an old raincoat would work.Also Mormon's don't just take care of their own.Contact the church and see if you could get a two week food order.You can also buy several long term food storage items from the Morman church at cost.Go to providentliving.org To get info on prices.Down load the LDS Prepaeredness manual for free.I hope this all helps. I would suggest she take some of the little bit she has left over and purchase rice and beans. For $10 you can get 5 pounds of each at a dollar store. For a couple of extra dollars she can get 2 cans of ham for additional flavoring and nutrition. She can store these in 2 liter soda or water bottles. (I bet with all those teenages around they go through a lot of soda). She can also use left over soda bottles to store water as well. If she doesn't purchase soda, she could always ask the neighbors and explain it as teaching the kids about recycling or a school project or something. This will go a long way in taking care of two of her most important needs quickly. That was a TERRIFIC article, Dixiebelle, thanks for sharing that! I really learned a lot- I think anyone could learn from that and I hope it helps Shelly, as well. My first suggestion would be to assess her current situation. What areas can some cuts be made in, and trimming done, to free up a little extra cash. Can you turn your heat down to 68 instead of the 72 most people seem to prefer? Great, if so, that can save you $20 or so a month in heating costs, that can go to your prep budget? Do you own a vehicle? if so, how many of your trips can be combined into one to save gas costs? Do you have anything in the garage/attic/basement that could/should be sold? If so, have a yard sale, you'll make some money, AND free up storage space for your preps. Do you have any 2 liter (1/2 gallon for you folks in the US) bottles around that can be used for water storage? Great, start filling and labeling them, and find a place to store them. Then, start planning what you need and researching what you're going to store. No point buying 500 lbs of beans if no one in your family will ever eat them, but buy things that you will use everyday…pasta, flour, rice, canned goods (fruits and vegetables), etc (this is far from a comprehensive list, or plan, it's just meant to get you thinking), and then build from there. Watch for sales, especially 1/2 price sales or BOGO's, that way you can buy what you would normally be budgeted for, but get double what you expected on some items (for example, my local store recently had 1kg (2 lb) jars of Kraft extra creamy peanut butter on for $1, since it's normally a $4 item, we bought 4 to equal the one we would normally have bought (we them bought 16 more, but thats not the point). I guess the best advice I can give without knowing you is figure out where you are, and then see what you can do to gradually end up where you want to be, and then set your feet to the path, and start the hike. I have homeschooled my kids (as well as several others). I am also disabled, but not in a way that affected my teaching. Perhaps you have a skill you can use in a similar way. Instead of asking for payment for my work, I asked for payment in skills I can't do, but need done, with the caveat that my kids be taught the skill at the same time (working alongside the provider). There isn't much a kid over 5 can't do, if taught safely. You might also trade your skills and time for the use of canning and/or dehydrating equipment when you do have food to put up. I also have a child with Asperger's syndrome. She has some of the most creative ideas on getting things done that would never occur to those of us without it. Indeed, her concentration level on a task exceeds that of most adults I know. Bottom line: don't panic. You have many more resources than you realize. Good luck! Coupon shopping has allowed me to stockpile everything from food, toiletries, laundry supplies, medicine and first aid supplies. I average 60% off on a regular basis, sometimes better! It does require having access to your local Sunday paper for the manufacturers' coupons. If you have a friend, family member or neighbor who gets the paper and tosses the coupons, ask them to give them to YOU instead. Best wishes and prayers that you prepping is a success! Welcome aboard. While I agree she needs to find a better financial situation, I know first hand that with disabled dependents that simply isn't always possible. Read as much as you can, make lists, review the lists before making decisions. I've found that buying a month's extra supply of food for storage is better than having nothing at all. We can't all have 2 years stockpile. That month gives me comfort in knowing I can at least get by for some emergencies. Probably the best thing you can do is to train. Learn skills. Get knowledge and experience. Not always easy seeing how most survival skills require expensive equipment. Borrow what you can. Make what you can. And definitely learn primitive skills which rarely cost more than a trip to the woods. Luck and best wishes. hi as the mum of a child with an Autistic Spectrum Disorder I would do what you can to make sure that you have everything in order for them in an emergency. The last thing you need in a crisis is them having a meltdown. I know its sounds ridiculous but i buy in extra boxes of the only brand of toothpaste that my daughter will use and I have duplicates or miniature versions of the familiar items that she likes to have around her in her b.o.b. I would ask yourself what can my child not cope without and deal with those things first. Also might be an idea to make some kind of visual emergency plans for your child with Aspergers and put them onto a mobile phone or digital photoframe or a keyring or laptop etc. I think of my own prepping as kind of a lifelong hobby, not a panic thing. After Halloween I might suggest the kids put gum, tictacs, lifesaver candies that they receive for Halloween in their backpack survival pouch. For Christmas, I often give the kids survival items as stocking stuffers. Little things, like small flashlights that attach to their pack, or hand warmers, And over the years, my kids have given me prep items for Christmas too! I started by making lists of what I wanted to store. I wound up with 6 lists. Items for my purse, the kids backpack, the car, a bug out bag near my door, a fire proof box for important papers and a few photos, and items for my home. My lists actually change from summer to winter, and I go through my stuff twice a year to check expire dates, exchange summer, winter things and so on. 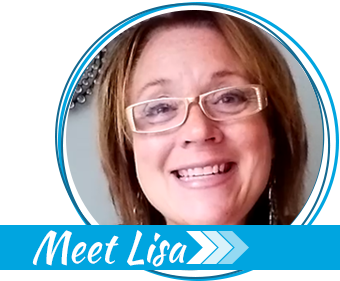 Lisa has great lists on this blog, which gave me lots of ideas for my own lists. There are also things to do, not just buy. first out. As I collect this and that, I like to try using my food my food from time to time as though there was no electricity. If I have pasta, where will I get the water from? How will I cook it? What if there is no butter, milk and cheese? What if I can't go on-line to get answers ? Figuring out the answers is interesting to me, worthwhile, not scary. A few minutes a day or a week on this is time well spent and puts you way ahead of where you were. I understand and empathize. I too am on a budget. very tight.. I try to pick up perhaps 4 or 6 cans of tuna or canned chicken on sale every 2 weeks. I get pasta on sale as I can. I bought a dehyderator, for 50 bucks and I do veggies and fruit when I can price match at walmart. I store in zip lock bags in my freezer as I can. It isn't easy but it is important. God Bless and keep the faith! Here is an opening that may be available to you; talk with people you know that are on gov't assistance or limited income and see what you could work out with them. Some of my child's friends ended up with children fresh out of high school. While they worked for minimum wage and received some gov. assistance, it was difficult for them to eat what nanny government said they could. When I found out, I told them I would "trade" for their unwanted foods. Every month I was able to store BAGS of beans and rice they couldn't/wouldn't use for what they needed for their child or themselves. I have an adult aspergers dtr who can be quite difficult and moody….so I understand your situation…but aspergers has a huge range of disability..my dtr is smart….can do things on the computer that I could never do….but her main problem is her socialization……beyond just praying for you, I'd suggest learning how to make your own stew….make a huge pot of it and use it for several meals…I don't make bread but I came across a recipe for beer bread that does not use yeast and I'll bet a few loaves of that with your home made stew would make the kids think they went to heaven…cooking and baking is really fun……at meatcounters, when nobody is around, ask the butcher is he has any "old" hamburger that he wants to move out….you'll probably get a better price….buy some of those little cans of ham they have on sale at Walgreens…Celebrity,etc….and cut that up into eggs or potatoes or rice or pasta and the kids will get some protein and flavor…. OK Shelly These are some of the steps I am taking. 1- I coupon, there are many sites online and in my area there are a trio of ladies who teach the art of couponing. 2- I’ve been going thru the house gathering things we don’t want or use for a yard sale, the money will be used for supplies. 3- We are fortunate to have a fire place and lay in a supply of wood for heat and in a pince for cooking. If you get the plans for items to build like a solar dehydrator. If you know someone connected with scouts a troop or individual working on their Eagle/Gold award might consider building some of them for you. Another thing you might get a friend to build is a wood fire grill out of cinderblocks. 4- Try to hook up with others in your area. Not sure how you'd do that ??? I am trying many things to see what works for us, but you have a lot to wade thru. this is easy. I'm in the same boat financially. So far I have a year supply of soap, razors, shaving cream, toothpaste, toothbrushes, cleaning supplies, medical supplies. What they cost me. Almost nothing. COUPONING!!!!! It's awesome. There is a tv show about it but the reality is far from it. It's a bit of work but with all those kids you can put them to use at stores that limit coupons to 1 per customer. One other thought for building things try churches for volunteers. Some of the groups like the Men's Club at our Catholic parish try to help when they can and help find assistance if they can't do it. Hope this helps. 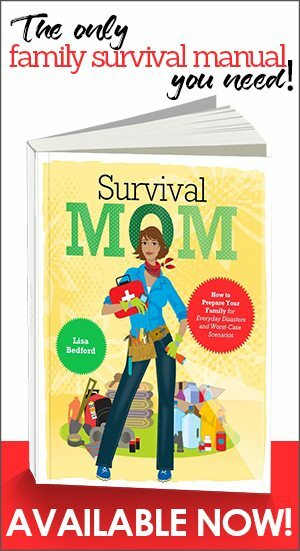 I've been a prepper all of my married life and I've learned so many tips from those of you who have posted previously! I would encourage Shelly to not focus on what she doesn't have, but what she DOES have on hand. Taking a good in-depth inventory will often surprise you as to your immediate resources. The web is an incredible trove of knowledge and skills to be learned by watching youtube videos and reading and reading and re-rereading articles by the pros. Then… proceed with the excellent advice posted on this site and keep a record of your success and progress. I think it will surprise you. Pray for guidance and then count your blessings. lots of great ideas,just find a book or site that tells you how to make things out of every day basic stuff. Soups and stews can be made to feed many when nice and hot. You can think better when your tummy is warm and full. My grandmother was an expert on making things out of almost nothing. Blees you and good luck. Coupons, Shelly, COUPONS!! I don't have a lot of extra money either but I've amassed a huge stash by using coupons. Every week I find the best coupon deal and buy 10 of them. This week I'm going to to be buying 10 stuffings and 10 cranberry sauces for .$50 each. 10$ total. I have a little extra money this week. I also shop at Walgreens. Every single week they have several things that can be gotten for free. My favorite web site is Couponmom.com. She puts the sales and the coupons together for you under "drugstore deals" for the best deal. I buy 3 newspapers each week and save every coupon in a binder. I also get extra inserts from my newspaper guy because I asked him. Shelly email me and I will walk you thru it. I'm happy to help. Shelly, I hear you! I am blessed with 5 with special needs and I have the same problem. It does leave us balancing at times it feels like we are drowning in medical. We have looked at prepping in several ways. There are lots of things you can do without spending a penny. Learn to sew and do hand me downs, as well as re purpose clothing for saleable items like pet quilts. Then we talked to each medical and made as low as possible long term arrangements to pay them off. Finally we watch coupons, make menus, and watch seasonal changes of stores like hawks. Once I found a grocery cart of off brand rice on sale right after Cinco De Mayo .50 cents for 5 pounds! That is how we make progress. I wish you the very best! Buy beef bones and suet and learn to make soup – the gelatin and excellent-for-your-health animal fats are high-calorie and delicious for the price, and preserve easily. Take three sections of beef leg bone (cheap! ), one package of beef suet (cheap! ), boil with water for several hours – add salt, a few stalks of celery, a couple of onions (quartered – don't bother chopping them up) and a can of tomato paste. Makes the best tasting soup you ever had, and the bang for the buck is beyond excellent. After a few hours of simmering to make sure you get as much as you can out of those bones, strain the bones/etc out, can or freeze (canning is better) most of it for future recipes, and for the rest you have left, add a little barley and bits of meat and you have a very cheap, very healthy, very filling dinner. You can do the same thing with chickens: roast a whole chicken (one dinner), pick off all the meat (lunches), then toss the bones (if you can find chicken feet as well, it is MUCH superior) into a big pot with water, the butter drippings from the pan you roasted in, a couple of onions and celery and let it boil and simmer for a few hours – chicken works well with rice as well as barley. Pork roast bones work as well – I like to add a bit of curry and spice and black beans (or lentils) to the broth/soup and then can it. So a widow can be a mom also?I have one handy capped daughter. My advise is get out of the US. I live here in Ontario Canada, I have it all except the knowledge of off Grid, and sharing it with a new mom. I receive info every day!The extra property has a pond. Even though my well is 329' deep there must be other water supplies.Do you have a back up plan. EG: next year I will become 65-It is time for the Government to force me out of my home by raising taxes and hydro beyond my means.A single dad or person will not see this comping. This is why I got the extra lot. I hope you can now see even the best plans may depend on others to share.All the best.James. one time when money was tight – I had put a add on Craigslist that I had baby spider plants to trade for any canned food that anyone that was cleaning their pantry didn't want any more. I ended up with a lot of food that had helped out during a hard time. I've gone to yard sales and sold things on eBay to get things for prepping. put a sign or a add out that your looking for canning jars or garden leftovers, or would love to pick nuts or fruit from trees that a homeowner might now want. I did babysitting for friends to earn a bit of extra cash. Those are all very creative ways of earning extra money. 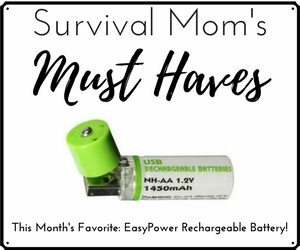 Leave it to a Survival Mom to figure out ways to do that!